1. Preheat oven to 425°. Spray 13 x 9-inch metal baking pan with nonstick cooking spray. In large bowl, gently mix beef, breadcrumbs and desired style ingredients (Buffalo, Rancher or Mexicali), except buns, cheese and toppings, until just combined; do not overmix. Evenly press beef mixture into prepared pan. 2. Bake 25 to 30 minutes or until internal temperature of beef mixture reaches 160°. Remove pan from oven; carefully drain liquid from pan. Evenly sprinkle beef mixture with cheese and bake 3 to 5 minutes longer or until cheese melts. 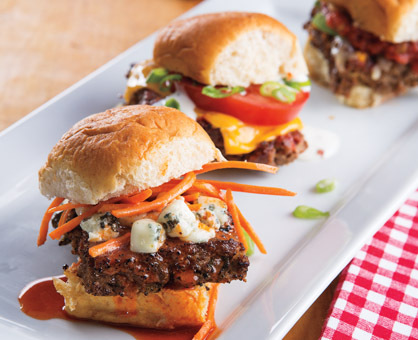 Cut into 12 equal burgers and serve on buns with toppings of choice, if desired.